Add all ingredients to slow cooker. Cook on low in the slow cooker 2 1/2-3 hours or 1 hour on high plus 2 1/2 hours on low. When done, meat should shred easily with a fork. Shred chicken with a fork. Toss to evenly coat with sauce. Serve on rolls. 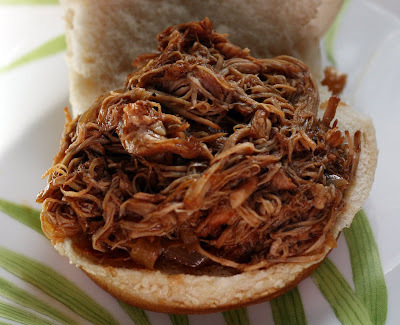 This is a pretty "quick" recipe as far as things in the slow cooker go. While you couldn't quite work a whole day and come home to a completed meal, it is perfect for a weekend when you might spend just a few hours shopping, doing housework or better yet, lazing around not wanting to cook and still have a homecooked dinner. This Hawaiian-inspired pulled chicken is perfectly balanced between fruity sweet and spicy and it yields just right level of sauce. The pineapple-ginger-balsamic combo should become a new classic, it is that good. I had actually never had pulled chicken before (sticking to my beloved pulled pork instead) but I am now a total convert and you will be too- who doesn't love saucy, juicy chicken sandwiches? The first day I served them on big, sesame seed buns but the leftovers made a great sourdough-coleslaw-sharp cheddar-pulled chicken panino. Side note:I used thighs from Just Bare Chicken which have a neat gimmick, each package has a number that you can use to look up the exact farm your chicken is from. Plus it is tasty!